The sweeping curves of the Purity Closing walk in shower will have plenty of admirers. 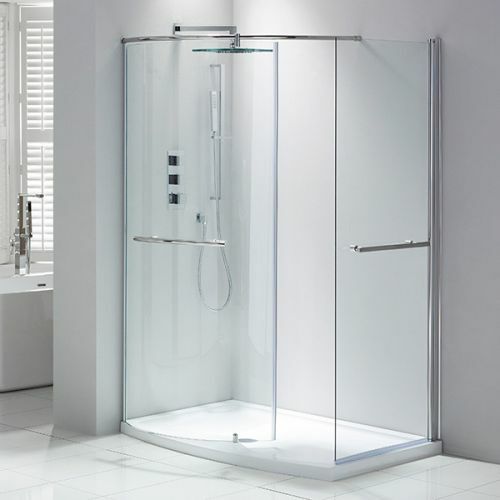 The gorgeous curved main screen follows the contour line of the dedicated bow shower tray included in the price. A wall profile, top rail and a small floor mounted bracket securely hold the screen in place. On the opposite wall a 900mm hinged walk in screen can be rotated to mate seamlessly with the curved screen to form a full enclosure. Both glass edges incorporate a magnetic seal to keep the water spray in and the space enclosed. Or you can just leave it open; it's up to you. Both pieces of Aquashield easy clean coated glass incorporate a handy chrome towel rail perfect for storing towels and dressing gowns ready for when you leave the shower. These towel rails compliment the style of the high level chrome support rail which also follows the curved glass and affixes to both walls. All in all a robust and attractive bow shaped space is created. The tray is dedicated to this walk in shower only and made from a stone resin mix. This means the shower base is strong, durable and will happily take plenty of daily use. Please note the LH enclosure option is shown in the main image.